My introduction to Hazmat began during initial Firefighter/EMS training with a brief overview of how to identify hazardous materials, establish hot, warm, and cold, zones; and set up decontamination operations. We also learned to use the Emergency Response Guidebook (ERG). I still rely on it as an initial resource because it is updated every 4 years. I remember an incident early in my career while working in the city of Battle Creek, Michigan out of station #4 Rescue Squad. We responded to our Fire Station #6 for a firefighter not feeling well. We arrived to find the LT. of Engine #6 seated on a couch having chest pain and trouble breathing. He was the picture of health prior to this and participated in various sports in his time off. About an hour earlier Engine 6 responded to a dumpster fire at the local high school. We soon learned that years of accumulated chemicals had been placed into the dumpster and caused a very toxic mixture. We transported the LT. to the hospital and that was his last day on the job, and the beginning of a downward spiral of debilitating physical problems. That was a huge eye opener for me. I am no longer directly involved with a Hazmat team but I am a Deputy Fire Chief of a rural fire department near Grand Rapids, Michigan. Bowne Township (Alto) Fire Department is a moderately populated farming community with a busy stretch of expressway (I-96) and a CSX rail line crossing through our jurisdiction. 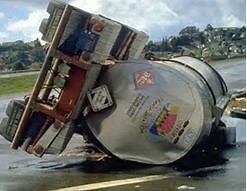 We have a large underground Liquefied Petroleum Gas storage facility that we have had some incidents with. Hazmat responses are rare but certainly a possibility. Our department provides Hazmat Operations level services and calls Grand Rapids Fire Department for a Team if needed. We also rely on several private services that deal with hazmat clean up. Private environmental cleanup companies provide a vast amount of services the municipal agencies have provided in the past. Their services are not cheap. I hope that sharing some of my experiences will help First Responders when hazardous materials are present. Many of the Hazmat scenes I've been involved with started out as other types of "calls" such as structure fires or vehicle accidents. During those incidents, we needed to rapidly change gears and reassess everything we were doing. For years we have been instilling a culture of safety in the fire service. We have made some needed mindset changes and continue to improve the levels of safety for first responders. Safety has also been improved by laws and regulations involving hazardous materials. Technology has also provided us with almost instant emergency information regarding hazardous materials. This proves very helpful in the treatment of those exposed to certain dangerous materials. As a department, one way we can be better prepared for Hazmat incidents, is to establish and maintain good working relationships with those areas that have dangerous goods or chemicals in our jurisdiction. We frequently visit and bring department personnel for tours of these companies or areas of concern. We preplan for incidents at these sites. For example, we have made very detailed preplans for the large underground Liquified Petroleum Storage facility in our town. It includes taking wind speed and direction into account. We have had several dangerous incidents at this facility and take it very seriously. One incident required the Texas based Boots & Coots to assist with a very large gas release. One of the biggest challenges during a Hazmat incident might be evacuating people from the danger zone. Many people do not want to leave their homes. I’ve been involved with several evacuations and they did not go well, to put it mildly. My best advice is to be very aware of the situation. Situational awareness is key to survival of any kind, especially when it comes to hazardous material. Be flexible and ready to adapt to changing situations. A simple change of wind direction can completely ruin your initial plan. Reassess the scene and situation constantly. Be ready to adapt and overcome. We have a saying in the fire department- risk a lot to save a lot, risk a little to save a little. Safety is always our priority. Rescuing viable patients or victims is our main objective. Training is vital to good outcomes in the field. Please be safe everybody. Deputy Chief Rick Vriesenga has been a Firefighter/Paramedic since 1984 and a Hazmat Technician since 1994.He became involved with the Kent County (Michigan) Hazmat Team in 1991 as an Operations Level Hazmat qualified team member. He performed various support and decontamination operations. 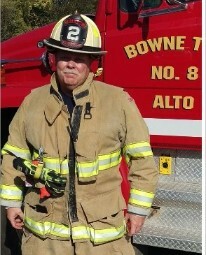 He is currently the Deputy Chief of the Bowne Township, Michigan Fire Department.